Figure in hard-paste porcelain painted with enamels of Pantalone in traditional costume. Bearded, he wears a black mask, red jacket, breeches, stockings and cap, and long flowing black cloak thrust behind him. Small rectangular base coloured greenish-brown. 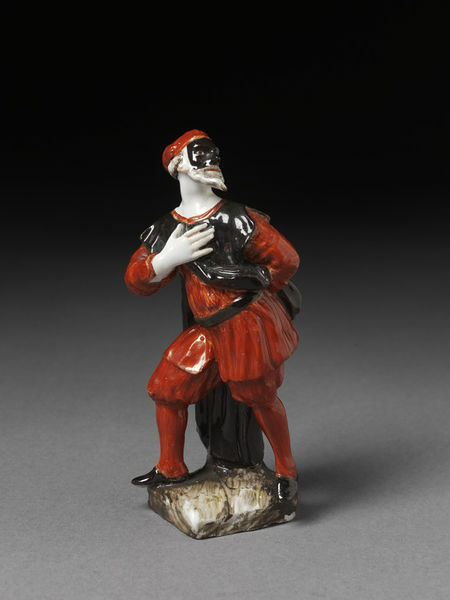 Figure in hard-paste porcelain of Pantalone, probably modelled by Gaspero Bruschi ca. 1765, Doccia porcelain factory, Doccia, ca. 1760-1770. 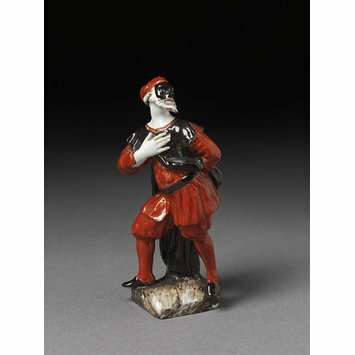 This statuette representing Pantalone is painted mainly in red and black following the traditional iconography. It is set on a square base which imitates a rocky outcrop. For the iconographical source of this sculpture, see cat. 29. This particular version, in our opinion, is slightly later than the other one (cat. 29), as is shown by the type of painting and the square imitation rock base which continued to be used also in the Second Period at Doccia (1757-1791). In the Museo di Doccia there is a version in biscuit that is 16 cm tall (inv. 1893-910, D’AGLIANO 2001, p. 257). Other examples of this version of Pantalone are in the Stibbert Museum in Florence (D’AGLIANO 2002, p. 23, cat. 11), in the Gianetti Museum in Saronno (L. Brambilla Bruni, in BRAMBILLA BRUNI,MELEGATI, ZENONE PADULA 2000, p. 68-71, cat. 14-15) and in the Museum fuer Kunst und Gewerbe in Hamburg. For historical information on the Commedia dell’Arte series cat. 33.